Autumn finished her latest Lego creation. 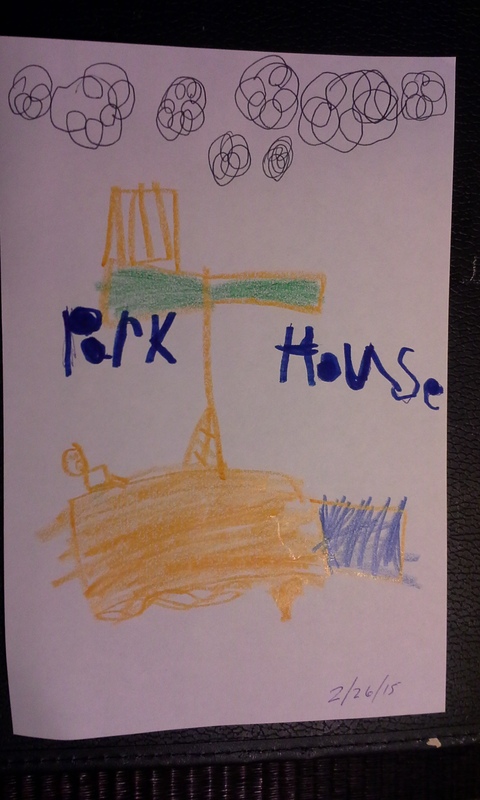 Autumn explained that a park house was a special place where people could rest and eat snacks while they played at the park. They were built among flowers and trees. Autumn’s park house featured a bed, lemonade stand and TV. “All the comforts of civilization,” her father said. Autumn and her father, Marshall, and his girlfriend, Chloe, were off to hike in the mountains near their home. They were met at a trailhead by friends, Steve and Kim, and their little baby, Luna. “Hi, Autumn!” Steve and Kim said. Luna, strapped to her mother’s chest, peered at Autumn with her big dark eyes. “Luna is so pretty!” Autumn said. Autumn heaved her Tinker Bell backpack over her shoulder, filled with Band-Aids and peanuts, and ran uphill. The adults trailed behind. After a while, they came to an open field, where stood a magnificent apple tree. Autumn couldn’t help herself. She rushed to the tree and tried in vain to pluck one of the red, shiny, low-lying fruit. The adults agreed that a lone apple tree in the wild was unusual, even for Los Angeles, a city where the unusual was not uncommon, but what happened next was more so. From the ridge, a white glistening unicorn galloped into sight. The majestic creature slowed to a trot and ambled toward the apple tree. There, it pulled the branches with its mouth, causing apples to fall. One landed in Autumn’s hand. The unicorn gently nibbled the apple, tickling her fingers, until swallowing it whole. The unicorn peered into Autumn’s eyes, neighed quietly, then vanished. Autumn turned toward the adults. “Wasn’t that awesome?” she said. Steve scratched his head. Kim adjusted the baby strap. Chloe sipped water from a bottle. Marshall gazed at his daughter. The adults shook their heads. They must not have seen the unicorn, Autumn thought. How strange. “Gather up those apples, and let’s get going,” Autumn’s father said. Autumn noticed that Luna continued staring at the empty space where the unicorn once stood. Then, she smiled at Autumn. Autumn smiled back. At least Luna knew. Autumn stuffed the fallen apples into her Tinker Bell backpack. She rejoined the group. They continued to hike. Finally, they came to a grassy clearing at the end of the trail. There stood a lone oak tree. An old woman with raggedy hair and dirty clothes was building something around the tree. It involved a blue tarp and a shopping cart and pieces of cardboard. But no one else seemed to notice the lady, except Luna. Like the unicorn, it was as if they couldn’t see her. As Autumn continued tugging on her father’s shirt, trying to get his attention, Marshall bent down suddenly and met his daughter, eye to eye. “Remember how I mentioned the word ‘civilization’ to you earlier today?” he said. Autumn stood in silence and watched the lady. Slowly, she opened her backpack. “May I give her an apple?” she said. When Valentine’s Day arrived, Autumn was sad to see that her father had neglected to bring her a card. But Autumn did not. She handed her father the red heart-shaped Valentine she made for him that morning and quietly walked out the door to the car. It was Saturday, and they were busy, as usual. First they were off to ballet class, then lunch, then grocery shopping, then to the park to play before dinner, bath and bed. Autumn loved the park, where she liked to make friends. “May I play with you?” she said to two girls. They were digging a hole in the sand. They didn’t bother looking at her. “No,” one of them said. Her lips quivered a little, and then she moved on. It didn’t bother Autumn as much as it used to when kids didn’t want to play with her. She learned from her father long ago that people were sometimes so absorbed in their own business that they could be inconsiderate of others. “May I play with you?” Autumn said to a group of boys. Autumn counted to ten, and then she chased the boys in a game of hide-and-go-seek. Because she was fast, she easily caught a boy, and because she was small, she easily fit into a cranny where no one bothered to look for her. This gave Autumn time to think. As she lay hidden, tucked behind a slide, she thought about her father. She was sad because he forgot to give her a Valentine. The more she thought about it, the sadder she became. It made her want to cry. Autumn heard a scratchy voice whisper in her ear. Autumn felt something in her hand. She peeked. It was an apple, shiny and red, just like the Valentine from her father should have been. Autumn wanted to take a bite out of the apple, but she hesitated. She wasn’t sure why. She ran to her father and showed it to him. Autumn turned toward the playground. She spotted the boys and girls, but not the lady with the scratchy voice who offered her the apple. “I don’t see her anywhere,” Autumn said. Autumn’s father opened his hand, and Autumn gave him the apple. “What do we call people we don’t know?” he said. Autumn’s father tossed the apple in a trash can. Autumn’s father handed her a folded napkin instead. “Thank you, Daddy!” Autumn said. She gave her father a hug. Autumn was happy, but she wasn’t satisfied. She still craved something sweet. “Come on,” her father said. Her parents rarely let her have sweets. They said sugar from cupcakes and candy and other stuff like that wasn’t good for her. As Autumn and her father left the park, she glanced back. She thought she saw a witch peeking at her from a tree. Once upon a time, a happy little girl named Autumn was on her way to an indoor playroom to celebrate her birthday with family and friends. As she walked with her father Marshall and his girlfriend Chloe toward their truck, they passed a big bush that started to rattle. “What’s the matter with that bush?” Autumn said. The bush stopped rattling. All was quiet. “Maybe there’s nobody in there,” Autumn said. Two big feet, which looked more like hooves, poked out from the bottom of the bush. “Maybe it’s scared,” Marshall said. “Are you scared?” Autumn said. The bush stopped rattling. Slowly, the feet emerged from the bush, connected to a large torso, connected to two arms and a large head. It was a troll, with a sad face. The troll’s face grew sadder. The troll nodded its head. But Autumn wasn’t so sure. “You promise not to hurt anyone at the party, right?” Autumn said. The three rode in the pickup truck to the indoor playroom where the party was to be held. The troll sat in the open back cab, with a big smile, as the wind whistled through its mangy hair. They arrived at the playroom before guests, and that was probably a good thing, judging by the astonishment of Autumn’s mother, Lauren, busy preparing the party. Sure enough, the troll was stuck as it tried to enter the playroom. Its face grew sad again. “Here, try this!” Autumn said, and she, her father, her mother and Chloe grabbed the troll by its arms and pulled. It worked. Once free and inside, the troll smiled. Autumn ran and clasped the troll’s leg, hugging it. “I believe in you!” she said. With that, mother and father did, too. Soon the guests arrived, boys and girls and their parents. Autumn was so excited. The troll stood in the center of the playroom. It was frozen with fear. It had never seen so many happy people before. It didn’t know what to do. The boys and girls mistook the troll for a play thing, like the slides and swings and tug-o-war rope of the playroom. They climbed its arms, clung to its back. This tickled the troll and made it laugh. “Wuf, wuf, wuf!” it shouted, filled with joy. This time the boys and girls were frozen with fear, as well as their parents. No one knew the troll was alive. They thought it was a giant toy, and they mistook its joy for rage. They thought it was mad, and they were scared. Kids cried. Parents panicked. They ran and tripped over each other. Some, feeling courageous, tried to use the tug-o-war rope to tie down the troll. The troll tugged back, playfully, lifting a few children and parents into the air, swinging them round and round the playroom. “Wuf, wuf, wuf!” the troll shouted. The children and parents were dizzy. They felt silly as they landed. They laughed. There was no reason to worry. The troll was fun and safe after all. The parents watched as children played with their new friend. Autumn’s birthday party was a great success. On the morning of her sixth birthday party, a little girl named Autumn arrived at her father’s apartment, delighted to find his girlfriend Chloe present. Autumn sprang for the bright, colorful gift bag. She pulled out a dress. Autumn whirled around the living room with the dress pressed against her, just like the birthday princess she imagined herself to be. The dress was pink with golden flowers, stars and a smiling half-moon centered on the chest. It was something Autumn asked Chloe to make for her long ago, and Chloe did, by hand, a labor of love sewed together over the course of many moon-filled nights. “Try it on,” said Autumn’s father, Marshall. This was the tricky part. Autumn, like some boys and girls, often was sensitive to the clothes she wore. Too snug or loose, and Autumn might complain the dress didn’t fit. If it had too many inseams and rubbed against her the wrong way, Autumn might complain it was itchy. In such cases, the dress would never be worn again, and because this dress was a surprise gift, Chloe wouldn’t know how Autumn felt wearing it until she tried it on. They stepped outside onto the walkway outside the apartment to take pictures of the birthday girl in her dress. Autumn played along, but her smile began to fade as she continued to flounder around the walkway and gaze down at herself. She didn’t like what she saw. “It’s too big!” she said. “I made the dress a little big on purpose, so you could wear it for years to come,” Chloe said. Autumn flopped around the walkway, unhappy, tugging at the straps. But it wasn’t Marshall’s words that bothered Autumn. It was the look on Chloe’s face. “And what do you say to Chloe?” Autumn’s father said. “Thank you for making me the dress,” Autumn said. Autumn changed into her Rapunzel dress. It was a Disney staple that was neither too big nor too itchy, and to Autumn it felt just right. Chloe grabbed a troll doll lying on the couch. It had a big smile sewed to its face, and Chloe put the dress on the troll that she made for Autumn. Chloe sighed, and she glanced at Marshall’s watch as he hugged her. “Speaking of time, it’s time to go to the birthday party,” she said. As they left the apartment, something magical began to happen. The birthday moon dress began to rattle. The troll doll wearing it started to grow.